(Nanowerk News) In fundamental physics, it is relatively easy to describe the motion of a single moving particle, but it is much more challenging to develop a reliable theoretical description of a particle such as an electron moving in an environment where it interacts with many other particles. Now, Naoto Nagaosa and Andrey Mishchenko of the RIKEN Center for Emergent Matter Science with colleagues in Italy have succeeded in constructing a comprehensive and mathematically exact description of the movement of particles within such an interacting environment as a function of parameters such as temperature (" Mobility of Holstein polaron at finite temperature: An unbiased approach"). The movement of electrons in crystals is one of the defining characteristics of materials and determines their behavior in many practical applications. As electrons move through a crystal, they interact with surrounding atoms via atomic vibrations known as phonons. 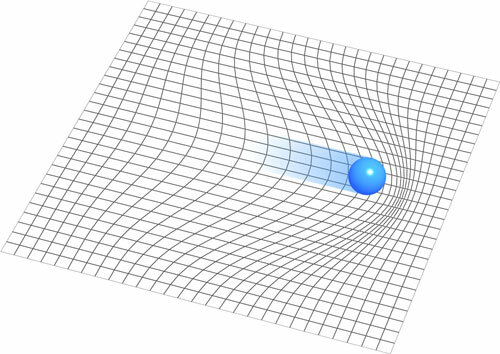 A particle moving in such a ‘phonon bath’ is known as a polaron (Fig. 1). “Polarons occur in almost every transport phenomenon in solids,” explains Nagaosa. Despite their ubiquity, however, deriving a mathematical description of polarons has proved a challenge that has confounded even some of our most famous physicists. The problem is the difficulty of reducing the complexity of interactions that make up a polaron to a few basic simplifications. Although this strategy works well for many problems in physics, phonon systems are so complex they defy simplification. Consequently, previous approaches have been limited to approximations only. In contrast, Nagaosa and his colleagues used mathematically exact computational methods without approximations to calculate results for specific scenarios. They then mapped the information gained from these calculations onto a two-dimensional ‘phase diagram’ of temperature versus strength of interaction between the electron and the surrounding phonon bath. The phase diagram revealed a strong dependence of polaron transport on temperature and strength of interaction, with several distinct transport regimes that explain many of the observed fundamental properties of materials, such as the electrical conductivity of metals and semiconductors. “The study of polarons and particularly polaron mobility is important for technology because polarons are carriers in many modern electronic devices,” says Mishchenko. Although derived in general terms, the researchers’ calculations and the resultant phase diagram are so far limited to describing polarons in one dimension. Extending the theory to higher dimensions will allow a more realistic description of polaron behavior and could lead to a fundamental model that describes a broad range of important effects in materials, such as magnetism and superconductivity.